A Cry in the Dark was released in Australia November 4, 1988, less than two months after Lindy and Michael Chamberlain were exonerated by a Northern Territories Court of Appeals of all charges in connection with the disappearance of their daughter Azaria near Ayers Rock eight years prior. Fred Schepisi, the film’s director and co-author of the screen adaptation of John Bryson’s book Evil Angels, was in at least as quick a “rush to justice” as the Australian media had been when Lindy was tried and convicted by a Northern Territory court of the murder of Azaria in 1982. Countering the anti-Lindy sentiment that prevailed among the Australian public and media at the time of the Court of Appeals acquittal, Schepisi attempts in his film to “set the record straight”. That his artistry reigned over his resentment toward the media and its distortion of the facts ensured A Cry in the Dark never descends into dogmatic preachiness. The evidence against Lindy Chamberlain was flimsy, supported by dubious “scientific” evidence. Nevertheless, the Northern Territory court, along with the far more ruthless Court of Public Opinion, didn’t like Lindy’s tough, almost defiant testimony and sentenced her to a life sentence of hard labor, despite her being eight months pregnant. A bit of the baby’s clothing, called a matinee-jacket, wasn’t found until a tourist discovered a badly decomposed body at the base of Ayers Rock – that of a man who had fallen from the rock and had been partially eaten by dingoes. Nearby, 150 meters from where the rest of the baby’s clothing had been found six years earlier, a game warden found the matinee-jacket, buried in a dingo lair. Lindy had frequently mentioned the matinee jacket in her testimony. Its discovery on February 2, 1986 – the one bit of direct evidence yet produced by either side – forced the courts to release Lindy “on compassionate grounds” just five days later. The Chamberlains were Seventh Day Adventists, a Christian religion whose only exceptional beliefs are in the imminence of Christ’s Second Coming and an observance of the Sabbath on Saturday. In 1980, however, just two years after the “Jonestown Massacre” in Guiana, South America, in which over 900 cultists committed mass suicide at the order of their leader, Jim Jones, many Australians viewed Seventh Day Adventists as a sort of religious cult, replete with apocalyptic prophesies as well as sacrificial plots. Much was read into the supposed meaning of the name “Azaria,” such as “sacrificed in the wilderness.” Lurid tabloid stories even portrayed Lindy as a witch and her fellow Adventists as devil-worshippers. The dingo, one of Australia’s many indigenous animals, is also, like the kangaroo, something of a national mascot. When Lindy Chamberlain claimed that a dingo had made off with her baby (the phrase made famous by the film’s ads: “That dingo’s got my baby!”), many Australians felt it as a personal affront. Legal arguments were presented questioning the ability of a dingo – the size of a spaniel – to carry a 10-pound baby in its jaws. Such an accusation also threatened the tourist trade: warning signs, which prohibited the feeding of dingoes, would now have to include warnings to keep children at a safe distance. Media interest in the Chamberlain case was unprecedented, and television cameras were allowed in the courtroom to cover the murder trial in 1982. The presiding judge’s advice to the jury was careful to warn them against being swayed by the storm of gossip raging outside the courtroom, despite the fact that jury members were screened to prevent bias and sequestered for the duration of the trial. But the media had already eliminated Lindy’s chance for a fair trial. Journalism, which has a proud tradition, has long since degenerated from accounts of “what happened” into “what the butler said happened.” Truth itself has become a matter of opinion. And lies have become so ubiquitous that many people mistake them for the truth. The Chamberlains were not only victims of a flagrant misprision of justice, which Lindy’s release from gaol did something, however small, to redress, they were condemned just as ruthlessly by the public. Although he presents the facts of the case, Schepisi makes it clear to us whose side he’s on. One of the controversies in the case was that Lindy was the only person who saw the dingo in the tent at the campsite, which supposedly carried Azaria off into the night. 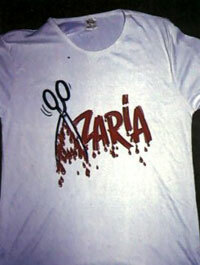 Schepisi staged the scene of Azaria’s disappearance very carefully, using eyewitness accounts. But when Michael Chamberlain hears the baby’s cry a few meters from the tent and Lindy walks back to see what’s wrong, Schepisi shows us what Lindy saw – the dingo, both inside the tent and carrying off something in its mouth. So, Lindy was not the only one who saw it. We saw it, too. The media are presented by Schepisi for what they are – cynical mediocrities whose only moral law is “what sells is good.” The predicament raised by A Cry in the Dark is not simply that we are dupes of the media, accepting their sneering half-truths and boldface lies as actuality, but that the truth is only as perfect or imperfect as the media which supposedly serves it. Self-fulfilling prophecies have replaced the truth when newspapers and television compete for a “market share” rather than narrating the news – not distorting information, but manufacturing it. The acting in A Cry in the Dark is unparalleled. Meryl Streep, bad hair and all, manages to bring off another of her transformations – this time as a middle-class Australian. Though her accent sounds a little broader than everyone else’s (to my American ears), she makes Lindy Chamberlain into a vital, powerful human presence (part of the real Lindy’s problem during cross-examination). Lindy was tried and convicted of her daughter’s murder, suffered imprisonment while pregnant, had to deliver her baby in gaol, and was given a whole hour to hold her newborn daughter before she was taken from her. And yet, it was obvious which of the Chamberlains was the stronger, since no one seems to suffer more than Michael, her husband. Sam Neill convincingly shows us something of the spiritual travail that Michael Chamberlain had to undergo during his family’s ordeal. Michael is driven to doubt his faith, even ascribing the capricious swings in public opinion to the Almighty. He is puzzled by what happens to him because he cannot understand why God would let it happen. Like a latter-day Job, Neill shows us an unwitting victim of fate, replete with sackcloth and ashes. And dozens of other actors use their brief time on screen to demonstrate the depth of feeling the Chamberlain case provoked in Australians, whether as protagonists or antagonists or simply as concerned onlookers. Schepisi makes much of the average Australian’s point of view. (In virtually every scene involving a gossiping Australian, there’s a beer in somebody’s hand.) On what A Cry in the Dark says about Australians, I, an American, am in no position to comment. What it says about us all is both chilling and enraging. Still, after the media frenzy which the film presents in all its disgusting verity, and the quite fickle surge and subsidence of public interest in the case, what the film will forever remind us of is borne out in its very title: one peaceful night in Australia’s boundless outback, a ten-month-old baby girl was killed by a dingo. Postscript. In 1992, the Northern Territory Court of Criminal Appeal awarded the Chamberlains $1.3 million in compensation. Lindy and Michael have since divorced. The film was released in Australia under the title Evil Angels whilst it was released in the U.S. as A Cry in the Dark. Cliff Murchison (Brian James) to Lindy when they learn that a rumor of Michael’s arrest made it all the way to New Zealand. Michael Chamberlain (Sam Neill) speaking to the press at the end of the film.